Dharmaraja Ratha is the largest and grandest of all the rathas in Mamallapuram. It is located on the southernmost spot on the rock from which other three rathas are also carved out, these three are the Draupadi Ratha, Arjuna Ratha and Bhima Ratha. Being the largest, referring it to Dharmaraja, the eldest among the Pandavas, is quite appropriate. But the fact remains that the ratha has no connection with the heroes of Mahabharata. Dharmaraja Ratha is a tri-tala (three story) structure. It is square at the ground level, at the first story and at the second story, above that it turns into octagonal with an octagonal shikhara which is devoid of stupi. The stupi of the shikara is found placed on the platform of the ratha. The octagonal shikhara puts the ratha in the category of the Dravidian vimanas. The ratha faces west, and a small projecting mukha-mandapa is provided as the main entrance. The ground floor is fashioned with a covered circumambulatory path around a square sanctum. The sanctum is not finished and left incomplete. This circumambulatory path, on each side, is supported on two pillars and two pilasters. The pillars and pilasters have seated-lion bases. This path is open on all sides, except at the corners where niches are provided on the external side. On the prastara (beam) above the pillars, runs a cornice (kapota). This has chaitya-arches (kudu arches/horse shoe dormer windows) with peeping human faces. Above the cornice is a regular arrangement of mini shrines, square (kuta) at the corners and oblong (sala) in middle. The pyramidal shikhara of the ratha is not a continuous one, but it breaks at each floor level. This ratha is unique in the manner that it has a sanctum in its every floor. The first floor of the ratha has perambulatory path around its sanctum, thus it is disjoint from the row of the mini-shrines of the ground floor. The square sanctum of the first floor is supported on pillars and pilasters providing niches to accommodate images. The second floor of the ratha, in the same fashion as of first, also has a perambulatory path around its sanctum. This also has niches on its external walls. 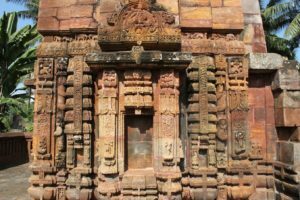 This is the most complete story of the ratha, and its sanctum has an image of Somaskanda, properly consecrated and inscribed. The ground and first floor are complete in their iconographic aspect however their sanctums are not hewn out. Nagaswamy1 tells that the plan was to have a sarvato-bhadra variety temple, open on all sides. The plan was also to provide steps at each side to reach the ground floor however this was not realized due to shortage of rock. He also tells that the tri-tala of the ratha represents three spaces, earth, outer space and heaven, also referred as Bhur-Bhuvah-Swvah. Inscriptions – There are total of thirty-eight inscriptions spanned across the three stories of the ratha. Thirty-six of these are short labels borne by the Pallava kings. The rest two are the foundation inscriptions for the sanctum at the second story of the ratha. These inscriptions are discussed while discussing the sculptures at these different stories. Nine labels are found on the ground floor. These all labels are inscribed on the beam above the niches housing various sculptures. Though there are eight niches at this floor, not every niche has a label inscribed above it. The two niches on the western face has no label, while few niches have more than one label inscribed. Isn’t it interesting why the images on the western niche were left without a label? Another interesting point is that its not only the niches on the western face which are bereft of labels, a niche on the northern face at the west end also does not have a label. The first floor has twenty-seven labels distributed unevenly across various niches and one on the parapet of the staircase leading to the upper floor. On the western face, we only find one label inscribed over one niche. Few niches of the floor have more than one label, and for the few the count goes to four. The second floor of the ratha has only two inscriptions, and these are the foundation inscriptions referring to the consecration of the sanctum of that floor. One inscription is at the beam of the central cell on the western face and another is above the image of Surya on the eastern face. Now, the point of discussion should be why there is such an uneven distribution of labels among these three stories. If we assume that the engraving of these labels should be done once the work is complete, we expect that majority of these labels should be found at the second floor which is the most complete one. However this is not the case as the top story does not have any label. If we assume that engraving of the labels started from the ground floor, then there must be some reason for why some niches on the ground floor as well as on the first floor were left without a label. It cannot be that the artists were exhausted of the labels as we find more than one label above many niches. Then what could be the case, were the titles of the ground floor and the first floor engraved by different kings? Assigning a title or label to a Pallava king is sometimes not very straightforward as the same title is being assumed by multiple kings. From the Pallava inscriptions found at other places, we have got a long list of titles for Mahendravarman I and Narasimhavarman II Rajasimha. We can ignore Mahendravarman in our discussion but Rajasimha cannot be ignored in this context. Let us study these different labels and mark them if those are found in any other Pallava inscription. If we have a look on the above list, we will find a mixed ration. There are many labels, found on this ratha, which are not among the known titles of the Pallava king Rajasimha, and vice-versa. Rajasimha has left more than two-hundred-and-fifty of his titles in his various inscriptions. If Rajasimha has any role to play with this Ratha, why the titles found here are missing from his exhaustive lists provided at other places, Kanchipuram and Vayalur. He would have surely remembered his titles engraved on this ratha and would have included those in his other inscriptions. This creates a confusion, if all the titles on this Ratha correspond to that of Rajasimha. We have only two other Pallava kings, who ruled for considerable period, between Mahendravarman I and Rajasimha, these were Narasimhavarman I Mamalla and Parameshvaravarman I. We have suggested at other place, that Atyantakama of Ramanuja Mandapa may be identified with Parameshvaravarman I rather than with Rajasimha. In this case, the inscriptions on the top floor of this ratha should be assigned to Parameshvaravarman I. But this poses another problem, if the topmost floor was completed during the reign of the Parameshvaravarman, then who engraved the titles on the ground floor as the construction was carried out in top down approach, first the top floor was excavated and then the lower ones. It means that the top floor was completed during the reign of Parameshvaravarman I and therefore he consecrated that with his name and titles. Atyantakama and Ranajaya therefore should be the titles borne by Parameshvaravarman I. If this is accepted, then can this ratha be started in the reign of Narasimhavarman I? Narasimhavarman I or Mamalla ruled from 630 CE to 668 CE. It is usually accepted that till his Badami (Vatapi) conquest in 642 CE, he would have been very busy wrestling the Chalukyas. If he started work at Mamallapuram then it would have been only after 642 CE. This gives a period of 26 years and this period should be enough to finish a ratha like Dharmaraja Ratha, in the state as it is now. Or better we can say that period of 26 years were enough to finish the top floor and consecrate that. However, it was not Mamalla who consecrated it, but Parameshvaravarman I and therefore we can safely say that this ratha was started by Parameshvaravarman I and not by Mamalla. Parameshvaravarman I ruled for about 30 years. He was also engaged with wars however he has a peaceful reign. If he started this ratha, then he had ample time to complete or finish it. However he was only able to consecrate the topmost floor. Why the ratha did not get completed in his reign may not be explained with certainty. However, it does suggest that the successors of Parameshvaravarman I were involved with the lower floors of this ratha. 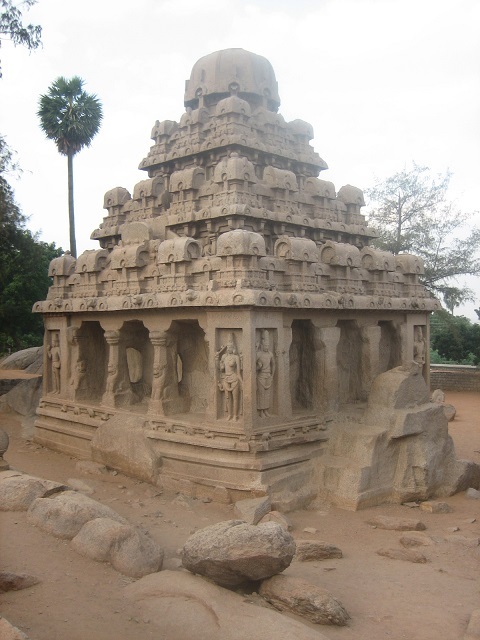 Among the successors of Parameshvaravarman I, it was only Rajasimha, his son, who is associated with Mamallapuram. Also we notice that many titles found on the ground and first story of this ratha matches with the known titles of Rajasimha. Rajasimha also ruled for about 30 years. It would remain a riddle why the combined rule of Parameshvaravarman I and Rajasimha, spanning for 60 years, wasnot enough to complete this ratha. We will discuss the incomplete nature of these monuments in another chapter, however we can state here that Parameshvaravarman I started the construction of the ratha and finished the top story, while Rajasimha was involved in the finishing of the first and ground floor. If this is accepted, then the royal portrait found at the ground floor, should be identified with Rajasimha but not with Narasimhavarman I Mamalla. I believe that our future research endeavors in this area will bring fresh lights into the topic to clear the clouds of mystery hovering over the topic.